In the world of smart phones and apps, managing things have become easy. There are numerous applications on the web that are used on a regular basis and people are relying more on the online and web-based programs that helps in managing things effectively rather than on a manual basis. Wrike is one of the most effective task manager apps that are useful for all business purposes. This application provides a user interface that is easy to follow. It has many features which help in the process of managing tasks easily. The best part of Wrike is its charts and activity stream. Wrike is an application for both agile and waterfall planning tasks. It has the feature to easily sync with Google Drive and Dropbox, etc. You may save your arranged projects by using this feature. The price varies depending on the usage. For fewer people of about 5 or less than that, the software is free. For more users, professional and enterprise gives more space which is a paid version. ProWorkflow is a simple task manager which is best suitable for small and medium business. Their user interface is in the format of a calendar and users can drag and drop the task list to keep all tasks well maintained and up-to-date. The special feature of this software is that it gives access to historical data and lets you to analyze the performance. It’s pricing starts from $10 for a single user and there are different rates depending on the requirement of the user. Jira is a task manager software mainly for issue and bug tracking. This app is used by most developers and software professionals. Jira also supports cloud hosting and server hosting. If you are not looking for bug tracking, then this app is not the one for you. Invoicera is the most suitable app for everyone that manages tasks accurately in sheets with a scheduled time slots making the work easier than ever. It is available in multiple languages and there are many free templates to start from. You can control every activity like staff activity, financial management and project management and also you can manage work efficiently. Mavenlink is specifically designed for people in finances as it is an enterprise grade based task manager. Mavenlink efficiently allows you to control online payments, manage expense reports, and manage with Quickbooks. Workfront is a well applicable software for marketers. Its cloud-based task management software helps in managing work efficiently with its project tracking and reporting features. It integrates with Outlook and you can manage work and schedules from there. You can also monitor your team from the Workfront work allotment and the recording of the progress of work. Liquidplanner ia similar to your computer and the user interface is easy and simple. The task list is stored in a folder and all the list will be shown in a dashboard. Liquidplanner allows you to manage tasks in scheduled time. 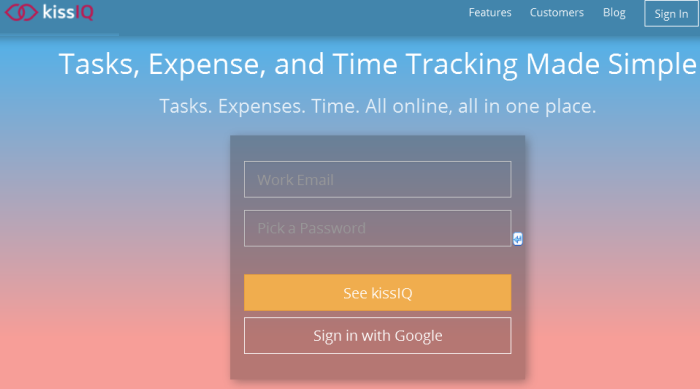 KissIQ is a task management software suitable for freelancers and small business. This has a basic user interface but works efficiently for an individual or small set of a team. The software has a simple board that provides a quick view of tasks, reports, costs and recurring costs. When I think of task management, Hitask is the only solution. Please add it to your list for a more relevant article. Thanks for the great read though. Hey, Nice Article you wrote. Elaborated all the features very creative manner. I’ve used Asana and Trello. Both are known for its services and features. I liked both of them and this article put a flashlight on various other tools in a unique way. Keep sharing such details with us continuously.